Plenty to think about for Brendan Rodgers. LIVERPOOL’S DISASTROUS DAY continues as Philippe Coutinho has been sent off for a second bookable offence. The Brazilian lunged into a clumsy tackle on West Ham midfielder Dmitri Payet and gets absolutely none of the ball. The referee deems the challenge a bookable offence and he’s off. Coutinho was booked just before half-time for dissent. West Ham have not won at Anfield since 1963 but with a two goal lead and the extra man, you wouldn’t bet against them holding on for the win now. Liverpool’s defence have received plaudits this year for their performances, earning three clean sheets up until this point. But they are having a nightmare today. Martin Skrtel’s poor headed clearance resulted in Manuel Lanzini’s goal and Dejan Lovren’s inability to keep the ball allowed Mark Noble to make it two nil. Brendan Rodgers’ side now have a mountain to climb if they are going to get anything from this game. 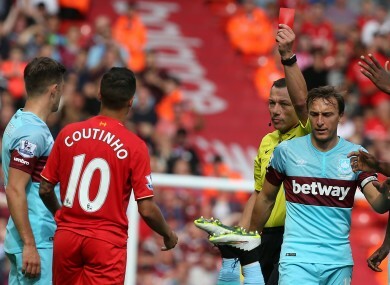 Email “Liverpool's disastrous day continues as Coutinho is sent off”. Feedback on “Liverpool's disastrous day continues as Coutinho is sent off”.